When you bought yourXbox 360the chances are it wasn’t because you were dreaming of playing a game in which you built a garden of hanging vines to attract William Shakespeare to your city while Ghandi shook a stick at you in a fit of rage. The chances are even slimmer that you pictured yourself playing said game, bellowing your civilization to victory while trying to shove a sandal up Ghandi’s rear. But that’s exactly what those clever chaps at Firaxis have done. They’ve taken a strategy game and managed to make it fun, by taking away those evil words that send shivers down the spines of anyone who’s played an RTS. There’s not the slightest whiff of micro-management, macro-management or any kind of grouping, which isn’t nearly as fun as it sounds. Instead, the clutter has been brushed away and what’s left is a simple strategy game where the depth and interest build from trying to second guess your opponents rather than negotiating more menus thanyour local five star eatery. The idea of Civilization Revolution is to usher your chosen nation to global dominance either through culture, finance, military force or the use of technology. Whether this means shoving tanks in the direction of your enemies or building up your own empire, it’s flexible enough to support your ideas and also makes it fun. It’s a little fiddly and it’s still not the sexiest game you’ll ever play. Yet regardless of whatever background you come from, be it FPS, RPG, MMO or WTF, you’ll take to Civilization Revolution like you’ve been playing these damn things forever. That’s high praise. A strategy game that appeals to the masses is something akin to the holy grail for fans of the genre. All you need is a couple of hours in the company of Civ Rev to fall in love. Go on. We dare you. 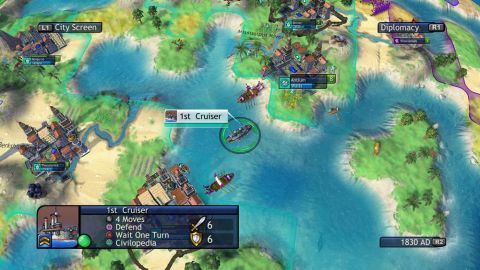 Description Sid Meier's Civilization Revolution offers a slightly simplified, but no less enthralling installment in one of the most well integrated and entertaining console strategy games yet.